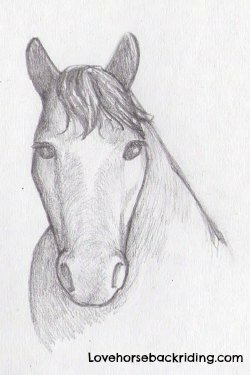 If you want to create a horse head drawing using one of the easiest techniques available, you've come to the right place. 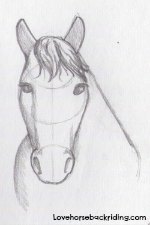 Many people would like to re-create the head or face of their cherished equine friend, but find it more difficult than they thought. Today you can learn how! I have broken out the how-to into bite sized chunks that will be easy for you to follow. 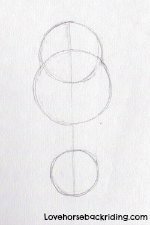 Remember, drawing takes lots of practice, so try this and the other tutorials I offer more than once. An overview of this step-by-step process follows. To start at the beginning for step one details, click "learn more" under that section, or "get started" at the bottom of the page. Alrighty then, lets get you going! In the first part you'll create some simple figures as you block out the beginning of what your design will look like. Starting this way lets you get the proportions of the head fleshed out quickly without getting bogged down on details. Next you will work on adding more curvy lines using the geometric shapes as your guide. You will also add ears. 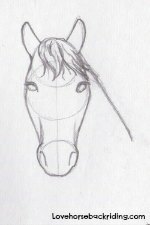 Here you will add eyes to the horse and give his head some realistic features and a forelock. Here you will remove your guiding shapes and shade it to add depth to your drawing. 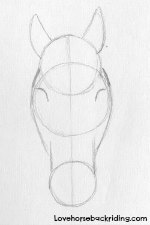 Leave this great horse head drawing tutorial to research more great related topics on care, training, and riding horses.